Flat foot is exactly what it sounds like—your foot has no arch and is flat on the bottom. When you stand, the entire sole of your foot makes contact with the floor. Flat feet are common and have a variety of causes, and while many people have no problems, others may experience a range of symptoms that can cause real issues. What are the signs and symptoms of flat foot? Flat foot causes your ankle to over-pronate—that is, your ankle appears to turn inward. Flat foot can also cause toe drift, where your toes and the front of your foot point outward. Because flat feet change the alignment of your legs, they can also contribute to problems in your ankles and knees, and even cause hip or low back pain. Most feet have an upward curve on the inside, between the heel and the ball of the foot. This is called the arch. Tendons running from the heel to the end of the foot bones, along with tendons in the lower leg, work together to form the arch. When the tendons have the proper amount of tension, your foot has a normal arch. When they don’t, you have little or no arch—which is called flat foot or fallen arches. There are two types of flat foot: flexible and rigid. In flexible flat foot, the arch collapses when weight is applied to your foot but reappears when the weight is removed. This is common in children, but is usually outgrown. In rigid flat foot, your foot is stiff and remains flat even when not bearing weight. Age – Children often have flexible flat foot but outgrow it. 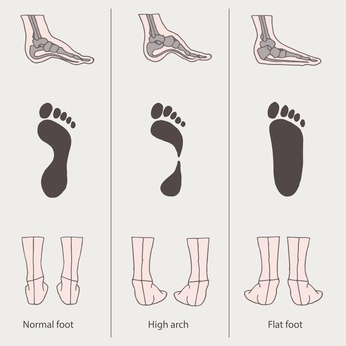 Rigid flat foot is more common with age, and often develops due to simple wear and tear. Foot structure – Some people have an abnormal foot structure and simply never develop arches. You’re more likely to have this abnormal foot structure if there is a family history of flat foot. Physical conditions – Conditions such as tarsal coalition can cause flat foot. This is a condition in which some of the tarsal bones—the rear foot bones including your heel bone and the other bones directly below your ankle—grow together and become rigid. Foot and ankle injuries – Injuries that damage the tendons of your foot or lower leg can lead to flat foot. Nerve damage – Nerve damage to your foot, whether from injury or due to medical conditions such as diabetes, can also cause flat foot. Pregnancy – Hormones secreted during pregnancy cause a softening of connective tissue, including tendons and ligaments. This, combined with the increased weight that pregnancy entails, can cause arches to flatten. Pregnancy-induced flat foot may or may not resolve after the baby is born. Other risk factors for flat foot include obesity and rheumatoid arthritis. There’s a range of options that may help flat foot, depending on the severity of your symptoms. An evaluation with an orthopedic foot and ankle specialist is important to determine what causes flat foot in your particular case. Orthotics – Shoe inserts which raise and support arches may help improve your symptoms. Changing your shoes – If you routinely wear sandals, flip-flops, or other minimally supportive shoes, you may need to invest in new shoes with proper arch support. Braces – Various types of braces may be used to support and stabilize your arch. Weight loss – if you’re overweight, losing pounds can significantly decrease the stress on your foot and may improve symptoms. Physical therapy – You may be advised to see a physical therapist. Physical therapy may include strengthening muscles and learning to stretch your foot and leg properly in order to keep foot joints mobile and prevent further arch collapse. If non-surgical treatments prove ineffective, surgery may be an option. What surgery entails depends on the condition of your unique foot, and each person’s needs are different. The goal of flat foot surgery is to realign your foot and eliminate your symptoms. This may include tendon repair, lengthening of tendons, or transferring of tendons. Removal of bone or bone grafts may also be necessary, depending on your specific problem. Whatever the severity of your symptoms, relief is possible. Dr. Katchis has over 20 years of experience in helping people get back on their feet and is a leader in the treatment of flat foot. If you are experiencing pain or other limitations due to flat foot, contact Extend Orthopedics today and schedule your consultation.